Everyone needs a straw hat. It is my Writers' Group meeting tomorrow. Sometimes we have an open manuscript meeting, where we can read any piece of 500 words or less - poetry, prose, travel - whatever we like. But sometimes we have a set theme - and this is so tomorrow. I like these less as I find it difficult to write "to order" about something I am not necessarily interested in. But I suppose it is a good exercise. The hat hung on the back of the door. The sunlight, which over the years had weathered the straw to a deep golden, cast a beam across the brim and across the flowers, which had faded with the years. When she had first bought it it had been a simple straw hat, plain, unadorned, meant for the utilitarian purpose of keeping the sun off the back of her neck. But, of course, Estelle being Estelle, she had been unable to leave it like that. She had made it into "Estelle's Hat" all those years ago, when the summers were long and hot and still, and the air was full of the sounds of droning bees. The ribbon was one from her ribbon box. How she had loved that box in those days when a ribbon was a thing to treasure. Where was the ribbon box now, he wondered? On a Winter's evening she would take it out of the cupboard, put it on the table and lovingly remove the ribbons, one by one, identifying them and smoothing them out. "That one was the belt from my second-best muslin dress. Oh how I loved that dress with its full skirt and its sprigs of lavender. And this one, the red one, (she would hold it up) was bought for me by that Bobby Jones at the fair one year." Then she would smile to herself, roll them all up tenderly and put them back in the box for another day. That Summer, the one when she had bought the hat, she had stopped an old gypsy woman in the lane when they were out for a walk and had persuaded him to buy for her a bag full of artificial flowers. When they had got home she had taken out her ribbon box and chosen a ribbon. Together they had gone into the hay field. He had sat in the hay while she sewed the ribbon and the the flowers, holding each one up before deciding where to fasten it. He could still hear her laughter if he concentrated hard. When the hat was finished she had put it on her golden curls and together they had danced round in the hay, her dress flaring out as she swung in his arms, the poppies in the field had moved in the breeze as though they were joining in the dance. When they had come home she had hung the hat on the door and there it had stayed for years. Children, work, holidays, gardening - all these things had come and filled their time so that there never seemed to be an opportunity to dance in the fields again. Maybe not even a desire. "Everyone needs a straw hat on the shed door for days like this." Today it is very hot here and the forecast is for it to getter hotter each day this week. I do not like very hot weather and am keeping indoors between 11am and 3pm when the sun is at its hottest. So there is a limited post today. I went down into the garden to collect a bunch of herbs for lunch - marjoram, parsley, sage, chives, mint, oregano and thyme - somehow just smelling those herbs made me feel cooler (sure it is all in the mind!). The buddleia is in full bloom - not the purple one but this lovely orange one. I counted over fifty bumble bees on it. I know it isn't a plant for the vegetable garden but there are so many bees on it that it must be good for the fertilisation of the flowering broad beans! Outside the back door, on the Calf House, the climbing rose is just coming into bloom and smells delightful. It is Alexander Girault and I have spent half an hour on the computer trying to find out who Alexander Girault was - does anybody out there know? Whoever he was then this lovely rose means that his name lives on. The fucshia and the marguerites outside the back door (it is shady there for most of the day) are also in full bloom. So that is today's photography done for you to enjoy. The farmer is also feeling the heat. Our heifers are in the field next to our neighbouring farmer's dairy herd and they would dearly like to be together. It's funny isn't it - animals have no concept of boundaries at all. The rabbits hop from A to B to C regardless of who the fields belong to. And similarly the cattle -they crowd round the gate between the two fields and, when it doesn't miraculously open for them, they crash through the wooden fence into the little wood, scramble over the beck, crash through another fence and get in that way. Together with the cows at last - that's the herd instinct coming to the fore and they are all happy. Well not now, as the farmer has spent the morning creating a new heifer-proof fence so that they are now back where they belong. Are humans alone in wanting to own things and then to put fences and barriers around their possessions in order to stop others getting at them? Wouldn't it be nice sometimes to live in a society where no-one owned anything and therefore no-one was possessive. I thought of the nomadic Bedou in the desert, moving from place to place but even they guard their possessions (including their wives!) when they up sticks and move on. And, thinking about it, Tess has about ten toys - balls, squeakers, chews - and woebetide anyone who tries to take one of them - she is on them like a ton of bricks. Oh dear - I have just destroyed my whole argument haven't I? It isn't just human nature. Keep cool. PS I forgot to mention Alberinte - she is also in full bloom and smelling superb. There is an exhibition at the Hayward Gallery in London until September 6th which is called "Walking in my mind." Yesterday Kate Muir wrote about it in the Times Review. She quotes the curator of the gallery as saying, "There are millions of nerve cells in the brain and the connections between these neurons, the synapses, are made by you." As I read it, the idea behind the exhibition is that we are all so many different characters inside our heads - what people see of us is what we choose to let them see. Doing my walk for yesterday's blog I got to thinking about this walking in the mind business in its wider sense. There seem to be so many facets to it. My previous husband used to say that I had the habit of doing every job three times. For example, first of all I would sit and think, "I think I'll clean out my wardrobe - I'll put all my Summer outfits together in the left hand side." Then I would have a cup of coffee, read the paper, have a chat, then go upstairs and clean out the wardrobe. Later on he would hear me on the phone to a friend, saying, "I've cleaned out the wardrobe and put all my summer outfits together in the left hand side." On a cold Winter afternoon I can sit in a chair with a photograph album on my knee - let's say one of our New England holiday - and I can walk that holiday in my mind again - perhaps taking an hour to do so - and the effect it has on me is almost as therapeutic as the holiday itself. I can read Thesiger's "Arabian Sands" AGAIN and I can be there with him in the Empty Quarter all those years ago. What an amazing thing the mind is. An aunt of mine, Auntie Ruth, who died many years ago, became frail and bed-fast in the final stage of an illness. When I went to see her she was only partially conscious but she smiled and told me that she had just had a tremendous walk all round the fields and lanes of Heighington, (where she lived as a child) - the way she told me about that walk I know she really thought she had been on it that morning. A couple of days later she died - not a bad way to end your life, is it? So - my post has wandered far away from the concept of the exhibition; but then has it really because the connections between my synapses have been made by me and this is how I choose to present it to you. Surely that - in the wider sense - is what it is all about. Where do you walk in your mind. Here and there - out and about. Another Saturday - how quickly they come round. The farmer is out cutting grass for other people today, so Tess and I have a day to ourselves. What to do? First there is gooseberry jam to be made. We have the best crop of gooseberries that we have ever had and not a sign of either sawfly or mildew (largely due to early spraying I think). I pick four pounds, come in and make eight pounds of jam - a lovely, jammy smell permeates the house. The jars look good when they are all full and I feel good too. Then we decide to go for a walk (well Tess decides and I acquiesce - the easiest option). On the way past the vegetable garden I notice the goose berry bushes - have I really picked four pounds this morning? If so then you really can't see where I have been, there are still stones of fruit to go. Gooseberry curd next? Shakespeare really knew his countryside when he said "summer's lease hath all too short a date". Already the wild flowers are on the wane and the grasses are going to seed. There are so many different grasses that I resolve to come out one day with my grasses book and see what they all are. In the meantime I take a few photographs of the more common ones. We walk over the fields into the village. The grey heron precedes us, rising up and tucking in his long legs, only to land a few yards further up in the beck again. It is not until we reach the lane that he flies back, passing us on his leisurely flight and landing behind us this time. We are visited by Mr and Mrs Curlew, both feigning broken legs/wings/beaks in their efforts to deflect our interest away from their wandering/hiding chicks. We reach the road, walk round the village, call in at my son's (Dominic Rivron - see blog list) for a cup of coffee and a sit in their lovely garden, and then it is home again. Watch this space later in the week for a spot of grass identification. Happy weekend to all readers. A spell of warm Summer weather and it is all stations go on the farm here - and throughout the Dales grassland farms. There is still some silage to get in, so grass is cut, left to wilt, baled up, wrapped, loaded onto a trailer, carted to a barn, or an open area, and stacked for winter. That is a time -consuming job I can tell you. Also the farmer still likes to make what he calls "a bit of hay", so this week he has also cut the paddock, left it to dry in the hot sun - and a sharp breeze which also helped, rowed it up, baled it, carted it to the barn and stacked it away - and I can tell you on good authority that the farm cats were not amused as they sleep in there. Added to that they came to shear the ewes. Many of them had already lost a lot of wool - the pasture bushes are festooned with clumps of wool - now that they are shorn they look such ungainly creatures but I am sure they feel better for it. We had the lambs in at the same time (each mother has two lambs) and they were kept back to be drenched and treated for flies - and boy were the mothers annoyed. The yard was full of bleating mums searching for their offspring and the collecting yard was full of calling lambs. Still - all's well that ends well - they are all back together in the barn pastures. Tess and I had a long walk to get away from all the activity. Now that the fields are cut short it is possible to walk through them again (not only is it hard work when the grass is long but it is also not good for the grass to be trodden down) and we walked along to our neighbour's land and up to his barn to look at his owl box. A barn owl has taken up residence, which is a good sign. We hope that next year he/she will find a mate. Then we walked back along Mill Lane, which for once was not the muddy track it usually is. Wild roses festooned the bushes and climbed up the trees; young fledgelings were being fed on the top of the wall; it was quiet and peaceful and by the time we got back to the farm most of the activity had ended. We are so lucky here in the UK that we have so many magnificent ancient churches to see. Our friends from Holland love them too. Yesterday we thought we would have a "gentle" day, so we just drove the ten miles to the little town of Masham to look at the lovely church there. This morning our friends have moved on so that they can explore the beauties of York before returning to The Netherlands, so today is a day for me to catch up on reading my bloggy pals. But here first for your enjoyment are a few of yesterday's photographs. In the churchyard stands a fragment of an Anglo Saxon pillar. Inside the church there is a beautiful embroidered altar cloth - I have put that on for the embroiderers out there. .I love these ancient tombs. It is as though they felt they could live for ever through this effigy in stone. Sir Marmaduke and his wife lie on a marble plinth surrounded by iron railings. They are looking out into the church and Sir M is leaning nonchallantly on his hand as though he is basking in the grass on a sunny day. They are supported by the kneeling figures of their six sons. It wasn't easy to photograph the whole tomb and the reflection of the light on the marble made the photograph much too light. But here is a close up of both husband and wife. And finally a new stained-glass window was commissioned a few years ago. I think it is magnificent - it incorporates various aspects of Dales life - there is the curlew and the swallow, the local sheep breed, various local wild plants, stone wall - everything which goes to make up our beautiful countryside. As you can see from the photograph there is the clearest deep blue which looks tremendous with the sun shining through it. Now I am off to catch up on reading other blogs - I haven't even finished reading the Mug Monday posts yet - didn't people respond well to the idea? We have visitors staying from The Netherlands and yesterday we took them over towards the North York Moors to the beautiful Abbey at Rievaulx. The setting is exquisite. Eight centuries ago St Aelred - the third abbot - wrote "Everywhere peace, everywhere serenity, and a marvellous freedom from the tumult of the world." I would say that nothing of that has changed. The abbey was founded by St Bernard of Clairvaux - twelve Clairvaux mnonks came here in 1132 and there has been an Abbey on this site ever since. I have put on just three photographs for you to see. A distance shot of the newer (relatively) part of the building, an interior shot (although of course there is now no roof) and a shot of a perfectly formed bird's nest which had blown down from somewhere on the masonry - what a beautiful piece of architecture that nest is too! Then we made a short detour to St Gregory's Minster in Kirkdale. There has been a church on this site since about 750. The sundial in the photograph is Anglo-Saxon and it tells us that the church was rebuilt in 1055. There is a sense of peace and tranquility here too. There are very early sarcophogae inside and the coolness was wonderful after the scorching heat outside. I hope you enjoy this brief tour. Thanks to all those who participated in Mug Monday - and to all those who commented on my blog. I am very limited for time this week but I will visit you all within the next few days. Meanwhile - enjoy this lovely sunny weather while it lasts - the farmer is busy making hay (while the sun shines) so our friends, who have their caravan in one of our hay fields, are going to sleep at night to the very English scent of new mown hay. A brief PS after seeing the daisy in the nest photograph - a translation for what the dutch call daisies is "May kisses" - don't you think that's lovely? Couldn't have come at a more convenient time - I am very busy with old friends coming to stay later today, so Tesco is calling loud and clear! This is my favourite mug. It was bought for me by my God-daughter at Christmas and it more or less sums up my philosophy of life. It is, by the way, an Emma Bridgewater mug. Enjoy your morning cup of coffee (and the piece of cake). Today is another busy day getting readyfor our friends to come and stay for a few days, so first of all a picture of the farmer cutting his cake - and then I did a quick trawl round the garden for you. The exquisite old-fashioned rose - always the first out in my garden - is Gertrude Jeykll and I picked just one of the blooms for the farmer's birthday. It has a faint, delicate smell and is without a doubt my favourite rose. It was bought for me by my friend M, who has a birthday tomorrow - so if you are reading this M just to say that this rose gives me such a lot of pleasure every year - it is always out for your birthday. The other plants which are out in profusion are the herbaceous geraniums. The blue one, Johnson's Blue, is alive with bees and I managed to get one in the photograph. The pink one is Patricia (also my name of course) and I bought it (because of its name) at a plant sale in The Old Rectory at Coxwold, where the author Laurence Sterne lived when he wrote Tristram Shandy. I do like plants with reminders in my garden. They make it like a notebook. Have you any plants with reminders in your gardens? Wherever we go in the world we try to bring back images of farming. I have posted some before, a long time ago. Here are three more. It is the farmer's birthday tomorrow and we are having a little lunch party with our friends from The Netherlands - so time is short today - I am trying to get all the preparations done today. 1. 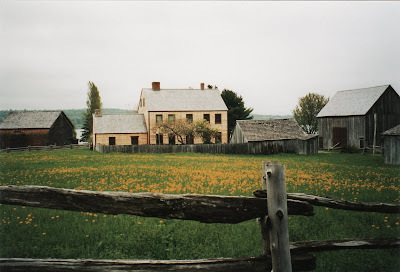 A buttercup field at King's Landing in Maritime Canada - this is a museum village - absolutely fascinating to walk round. This field is part of the village farm. Our fields are full of buttercups at the moment and although they look lovely, according to the farmer they do not make good hay. 2. 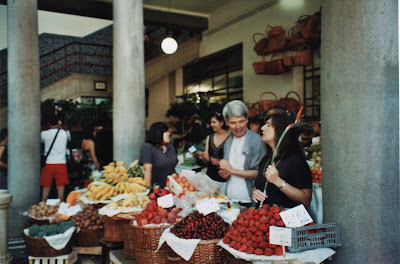 A Farmers' Market in Funchal, Madeira, where the produce and the flowers were so fresh - I wish this was smellyvision because the smell of fresh strawberries vied with the smell of beautiful flowers. 3. Reindeer farming at Nordkapp in Norway. This very bleak landscape, well above the Arctic Circle. is home to the Sami people and to their herds of reindeer. 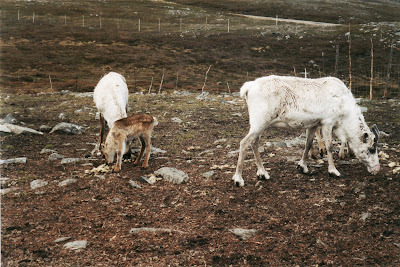 We were there for the Summer Solstice, six years ago this very week-end and the young reindeer had just been born. I think farmers feel an affinity with other farmers wherever they go in the world. Each kind of farm is different, each has its problems but one thing is certain - they are all jolly hard work. Enjoy a pleasant week-end everyone. Labels: farming round the world. The first lot of silage is all gathered in on half of the farm - the other half is still growing. As it has had no fertiliser on it and has relied on slurry (sorry pooh again) it has been a bit slower growing, but it will be cut shortly. In the meantime it is important to keep stock out as they can create havoc - not only eating the grass but trampling it down. Yesterday our neighbour's young sheep decided that the grass was greener on our side of the hedge - in fact it was the young hawthorn shoots they were eating. Several decided to push their way through the hedge, have a good feed and then lie down. As you will see from the photograph, the farmer is looking for them but not having much success. In fact, just after I took this photograph they shot past him, jumped the beck, cleared the wall and ran off back up their own field. The farmer has mended the hole in the hedge and all is well again - for now! At last my favourite honeysuckle is out on the hedge by the pasture gate - I wish you could smell it first thing in the morning - wonderful. I went up the lane to the gate to photograph it and my friends, the heifers, had to come and look. They say that curiosity killed the cat - well all I can say is that cows are a close second. Today is sunny but windy and the wind is blowing last year's pine cones off the Scots Pine trees by the farmhouse and the air is full of pine needles so there will be plenty of clearing up to be done when the wind drops. We are lucky in this emancipated Western World in that the lives of most people are governed by personal choices. I suppose the only two experiences which we all share are those of being born and dying. Other than that, to a large extent, our lives are governed by the choices we make. I am often struck by this thought when considering my choice to move to this area from a Midlands city. If I had not done so then the farmer's and my paths would never have crossed. Where would I be now, and what would I be doing? In my "Favourite Words" book (see one of my blogs last week for details) there is a poem which says it all so much better than I can. the turning that we don't take. words of wisdom. How has your life been influenced by the choices you have made? It is worth a few moments contemplation. Yesterday I spent an hour with the physiotherapist dealing with various aches and pains - very painful it was too - but, as they say, there is no gain without pain, so I have high hopes of an improvement (there is already a slight one today.) Shortly after arriving home again a friend and I went to a special nature site quite near to here, where there are quite unusual wild flowers. Unfortunatly we were a fortnight too late and only already seeding plants were there. There had been swathes of thrift and scurvy grass, a smattering of orchids, rock roses, thyme - plants which don't really grow in our area but which were growing there for a certain reason. The area had been a lead mine and there were spoil heaps still around and these heaps had attracted plants. I took some photographs but thunder was threatening while we were there so we were hurried, and only after returning home did I find I had taken most of them in the wrong mode. Later in the week it is the farmer's birthday and friends from The Netherlands are coming to celebrate it with us, so I am beginning to make preparations. This afternoon, after sitting out in the sun over a cup of tea, I feel just like Tess looks in the photograph - so this isn't a proper blog today bloggy friends. I apologise for that and shall hopefully think of something more erudite for tomorrow. In the meantime look how Tess has grown up (she is ball-mad) and enjoy the photograph of the avens going to seed. Up here there are wood avens and water avens and even a hybrid of the two. I don't know which this is - but the farmer calls this plant Soldier's Buttons. In the Summer, when we have a lot of tourists round here, I often speak to strangers - particularly if they have a dog in tow. Last year I met a chap with two pugs - one of my favourite dogs - and we chatted happily for half an hour in the market place. We shall never see each other again; we know absolutely nothing about each other and yet we spent a pleasant half hour together. How often this seems to happen, doesn't it? Years ago in my "previous life" I used to play early music. For several years our early music group, together with a group of dancers, used to perform on the lawns at Warwick Castle for the Summer tourists. They used to video us as we performed - this was particularly true of the Japanese tourists and we used to joke that we must feature on so many Japanese videos. I like to imagine ageing Japanese tourists looking at their old holiday videos and myself playing the crumhorn in their living rooms. On my sitting room wall I have the pencil drawing in today's photograph. It was given to my previous husband by the artist, Toni Bartl, (who's work he much admired) in return for some small job done for him. All I know about the sitter is that she was a Parisian girl and that Toni drew and painted her over a period of weeks - she became his muse for a short while. Now she resides on my wall, looking out at me. I look at her every day - I often wonder who she is, where she is, whether she is still alive (1948 is the date on the drawing). I am sorry about the reflection of the flash in the photograph - but then I think it is quite appropriate - we are seeing her behind glass and we can never get any nearer to her. In a way bloggers are ships that pass in the night - although these cyber-relationships somehow seem to be more lasting, don't they? I suppose things like air transport, television, cyberspace, photography - as they develop and get more sophisticated, so contact with other people widens and develops, and the world (in theory) becomes a smaller place. That has got to be good, hasn't it? Do you have any "ships that pass in the night" moments that are memorable? A meme perhaps. The farmer is a keen vegetable -gardener - or rather, he is a keen fresh vegetable -eater, so makes the time to garden so that he can just stroll down and cut the veggies in time for lunch. I used to love helping him but now find the effort too much, so my role is to "advise" (hence the title of this piece)! The veggies are all in the ground - the seeds, the plants grown from seed - and they are growing well. We have had plenty of sunshine and plenty of water - perfect growing conditions. So far he has managed to keep top side of the weeds by going round with the hoe every two or three days. I have put a photograph from each corner of the garden. It is bounded either by a building, a hedge or a wall. You can see the building (painted black). It shelters the top third of the garden from the sun for a large part of the day. The soil is fairly heavy clay. In spite of the title (a joke really) I have put this on in praise of the farmer, for I have to say the garden looks a picture. The gooseberries are almost ready for picking, the strawberries and raspberries are well formed and beginning to swell and the lettuce is delicious. In the greenhouse (lots of glass missing, as it catches the wind) we grow only potatoes in boxes - last year was the first year we had tried it and they were very successful (slugs kept at bay) so we are doing it again. Quarries are never a pretty sight. They are usually out in the countryside, they leave great holes in the ground, the machinery is noisy, even the gravel being shunted into the lorries breaks the rural silence. But the ones on the side of the road to Ripon are well-shielded by a thick belt of woodland, at present wearing its early Summer choice of greens and full of birds. And by the side of the quarry is an old set of quarry workings, now worked out. These deep holes are full of water and a really spectacular Nature Reserve has been created. Yesterday morning a friend and I, with our dogs, (on leads, for obvious reasons) walked around the perimeter. What a lovely hour we spent. There were marsh orchids, bright clumps of birds foot trefoil, banks of red campion and patches of stonecrop (we used to call this Old Man's Tobacco when we were children). On one lake there was a creche of young geese carefully supervised and marshalled by the whole flock as they glided amongst the reeds. On another lake (see photograph) surrounded by trees and sporting a border of yellow water iris, a swan and her cygnets were cruising. We walked round accompanied by birdsong, caught sight of a great crested grebe with her young and spent a very pleasant hour in the peace and quiet of the wetlands - the only disturbance was the occasional scrunch of gravel sliding into a lorry and a bird-scarer keeping birds of the crops in a nearby field.